Water chlorination through the process of electrochlorination involves producing Sodium Hypochlorite, commonly known as bleach, by introducing an electrical current into water containing salt. The bleach that is produced during electrochlorination can be diluted and used to disinfect water, making it safe to drink. Cities commonly use water chlorination in municipal water treatment facilities. It is possible for small villages to use the same process, on a smaller scale, to produce small quantities of sodium hypochlorite on an "as needed" basis and use it to disinfect their drinking water. In the process of electrochlorination, electrical current (Energy) is added to water (H2O) containing sodium chloride (NaCl). Water chlorination through electrochlorination is sometimes used, in industry, to desalinate ocean water. In these cases, where ocean saltwater is used and the goal is to desalinate the ocean water, other by- products can be produced because of the variety of salts found in the ocean. The other products, however, are low in concentration and are not harmful to the industrial processes for which the water is used. In the case of drinking water, sodium hypochlorite has been used for disinfection for almost one hundred years. Some of the advantages of electrical production of sodium hypochlorite include the ability to produce sodium hypochlorite on demand thus avoiding the problems associated with chemical storage of bleach products and the need of constantly buying bleach products. Electrical production of sodium hypochlorite also eliminates handling of bleach products and any threats of spillage or introduction of chlorine products into the environment. Electrochlorination has the additional advantage of being SCALABLE. Small portable electrochlorination devices are available that run on household current or even off of a 12 volt car battery or off of power supplied by solar panels. These units make it possible to supply safe drinking water for a small village by producing sodium hypochlorite that can be used to disinfect water used by households. 2 to 5 times to create a disinfectant solution for cleaning surfaces, utensils, food handling equipment and hospital equipment. The concentrated sodium hypochlorite solution can also be diluted up to 4000 times to produce enough drinking water for up to 6000 people! 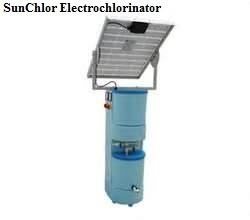 The SunChlor Solar Electrochlorinator boasts the capacity to produce 8 to 140 liters of concentrated sodium hypochlorite solution in an 8 hour period, depending on the model chosen. 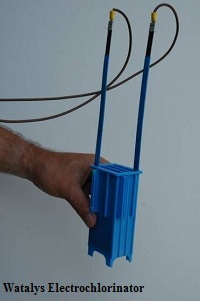 This solution can be used to produce 60,000 to 1,000,000 liters drinking water containing 1ppm chlorine. It is all done using a solar panel hooked up to a 12 volt battery. The amount of salt consumed during the eight hour process is 250 grams to 4.5 kilograms. The capacity to produce large quantities of safe drinking water through the acquisition of a solar electrochlorinator and the salt required to fuel the production of sodium hypochlorite has implications for village-level water treatment and entrepreneurship at the village level. A village entrepreneur or a group of entrepreneurs could purchase their own solar electrochlorinator through micro financing, cooperative lending, or subsidizing. They could produce sodium hypochlorite and use it to purify water and sell that water by the liter or by the gallon. This centralized water supply could provide every community member with clean, safe drinking water at an affordable price and provide an income for the local entrepreneurs. Return to "Water Treatment" from "Water Chlorination"